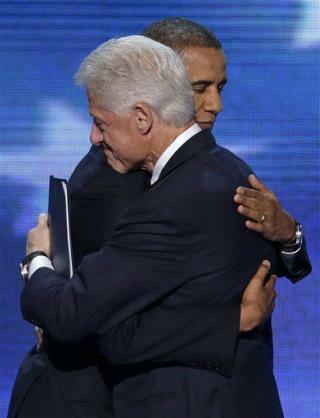 (Newser) – The Democrats unleashed their silver attack fox tonight, as Bill Clinton dusted off his convention chops to debunk a host of charges leveled against President Obama by Mitt Romney—and earned a hug afterward from the president himself. Clinton first formally placed Barack Obama's name into nomination, saying he "wants a man who's cool on the outside, and burns for America on the inside." He hailed Obama's "constructive cooperation" in politics. Clinton pointed to Obama's reaching out to the GOP and to Democrats he battled against in the last election. "Heck," Clinton joked, "he even appointed Hillary" secretary of state. "What works in the real world is cooperation," he added. "Democracy does not have to be a blood sport." As for the economy, Clinton pointed out: "No one could fully repair the damage" left by the GOP in just four years. In Tampa, "the Republican argument was pretty simple: We left Obama a total mess, he hasn’t finished cleaning it up yet, so fire him and put us back in," Clinton explained. Well,, he rocked Monica lewinsky too,you see how that ended up!